There are numerous methods of divination that people have used since time began. 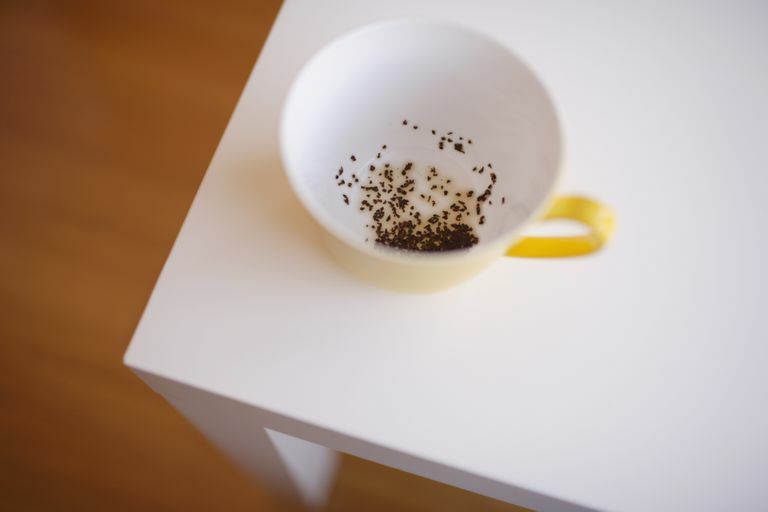 One of the most iconic is the notion of reading tea leaves, also called tasseography or tasseomancy. The word is a blend of two other words, the Arabic tassa, which means cup, and the Greek -mancy, which is a suffix indicating divination. This divination method isn’t quite as ancient as some of the other popular and well-known systems, and appears to have begun around the 17th century. This was around the time when the Chinese tea trade made its way into European society. Rosemary Guiley, in her book The Encyclopedia of Witches, Witchcraft, and Wicca, points out that during the medieval period, European fortune-tellers often did readings based upon spatters of lead or wax, but when the tea trade boomed, these other materials were replaced with tea leaves for divinatory purposes. Some people use cups that are specially designed for reading tea leaves. These often have patterns or symbols outlined around the rim, or even on the saucer, for easier interpretation. A few sets even have Zodiac symbols on them as well. How does one read tea leaves? Well, obviously, you’ll need a cup of tea to start with – and make sure you don’t use a strainer, because the strainer will eliminate the leaves from your cup. Make sure you use a light colored teacup so you can actually see what the leaves are doing. Also, use a loose leaf tea blend — and the larger the tea leaves, the more efficient your reading will be. Blends such as Darjeeling and Earl Grey typically have larger leaves. Try to avoid the Indian blends, because they include not only smaller leaves, but also occasional dust, small twigs, and other bits of detritus. After the tea has been consumed, and all that’s left in the bottom are the leaves, you should shake the cup around so the leaves settle into a pattern. In general, it’s easiest to swirl the cup in a circle a few times (some readers swear by the number three), so you don’t end up with wet tea leaves everywhere. Once you’ve done this, look at the leaves and see if they present you with images. This is where the divination begins. There are two typical methods of interpreting the images. The first is to use a set of standard image interpretations — symbols that have been passed down from generation to generation. For instance, an image of what looks like a dog typically represents a loyal friend, or an apple usually symbolizes the development of knowledge or education. There are a number of books available on tea leaf symbols, and although there is a bit of variation in the interpretations, usually these symbols have universal meanings. The second method of interpreting the cards is to do so intuitively. Much like any other method of divination— Tarot, scrying, etc. — when tea leaves are read using intuition, it’s a matter of what the images make you think and feel. That blob of leaves may look like a dog, but what if it doesn’t represent a loyal friend at all? What if you’re positive it’s a dire warning that someone needs protection? If you’re reading intuitively, these are the sorts of things you’ll run across, and you’ll need to decide whether to trust your instinct or not. Often, you’ll see multiple images — rather than just seeing that dog right there in the center, you might end up seeing smaller images around the rim. In this case, start reading the images in order beginning with the handle of the teacup, and work your way around clockwise. If your cup has no handle, begin at the 12:00 point (the very top, away from you) and go around it clockwise. What you saw first: Often, the first thing you see in a tea leaf reading is the thing or person that is the most influential upon you. Letters or numbers: Does that letter M mean something to you? Is it in reference to your sister Mandy, your coworker Mike, or that job you’ve been looking at in Montana? Trust your instinct. Animal shapes: Animals have all kinds of symbolism – dogs are loyal, cats are sneaky, butterflies represent transformation. Be sure to read our articles about Animal Magic and Folklore for more information on animal symbolism. Celestial symbols: Do you see a sun, a star, or a moon? Each of these has its own meaning – for instance, the moon symbolizes intuition and wisdom. Other recognizable symbols: Do you see a cross? A peace sign? Perhaps a shamrock? All of these have their own meanings, many of which are culturally assigned – what does that symbol mean to you personally? Finally, it’s worth noting that many tea leaf readers divide their cup into sections. Where an image appears is nearly as important as the image itself. Dividing the cup into three sections, the rim is typically associated with things that are happening right now. If you see an image near the rim, it’s regarding something immediate. The center of the cup, around the middle, is usually associated with the near future — and depending on who you ask, the near future can be anywhere from a week to a full moon phase of 28 days. Finally, the bottom of the cup holds the answer, as a whole, to your question or situation as it stands now.